I managed to get my hands on the Nokia Arte 8800 this year and was bowled over by it. I loved its weight, its style, and if it weren’t for the matter of a few hundred pounds it would be in my pocket right now. Well now it’s back, and better than ever! As well as an inflated price tag, you’re looking at 4GB of internal memory, as compared to the previous 1GB. Well, that’s worth an extra hundred right? You get all the features of the previous Arte models, with 3G capabilities, a 2 inch OLED display and a 3.2 megapixel camera. There’s also the tap-for-time feature, which lets you see the time by, ah, tapping. Yessiree. Still, it’s a lovely looking piece of kit, and if the last model was anything to go by, it’s seriously covetable. The Nokia 8800 Carbon is a fantastic phone. It has an elegant design and has good features. The Nokia 8800 is a classic mobile phone. I had purchase one in 2001, at that time the phone was considered to be a top-notch device. Infect I quiet like the Nokia 8800. The phone even now still looks very attractive and rich with design effect. Nokia phones are the best phone investment that you could make. Year after year they have been providing quality phones for consumers. 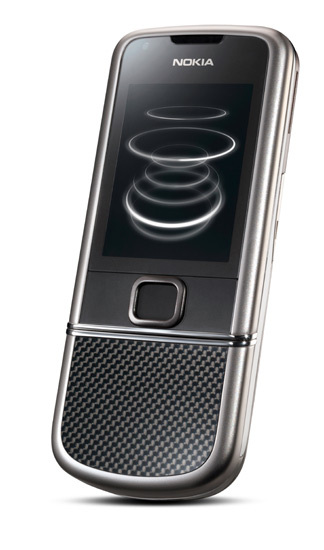 Unfortunately the new Nokia phones can cost you an arm and a leg, especially an unlocked Nokia 8800. I found a great site to find unlocked Nokia cell phones from auctions. I bought 2 Nokia 8800 cell phones for me and my wife, and we love them. Check them out at Unlocked Nokia Cell Phone Auctions. Just my 2 cents. Does the Nokia 8800 have User Selectable Fonts and is the information included in the specs? Oops, my mistake, it’s £870! Have changed the price now, thanks for telling me. There is no way in hell this is going to only cost £370 from Nokia, even the normal Arte is £695 sim free! If it is £370 I am buying one for Xmas, I miss my Sirocco.